Follow this link to view the Transportation Master Plan Final Report which was adopted by Council April, 2014. The Appendices for the Final Report can be found here, TMP Appendices. The existing Transportation Planning Study for Hastings-Belleville was completed in 1990 (Hastings-Belleville Transportation Master Plan). This Plan focused exclusively on vehicular travel demand, and developed recommendations for road network improvements to accommodate future growth. 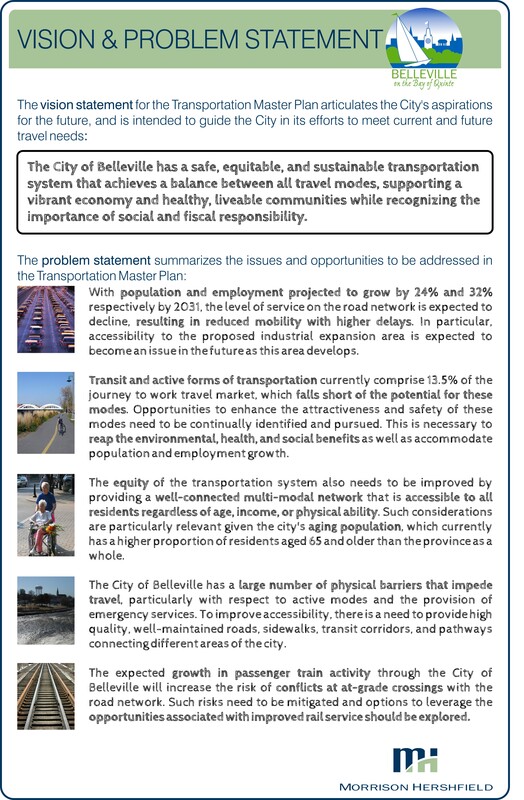 In 2011 a new Transportation Master Plan (TMP) will be created for Belleville reflecting the changes to population and employment trends, as well as attitudes towards other forms of transportation such as walking, cycling and transit. 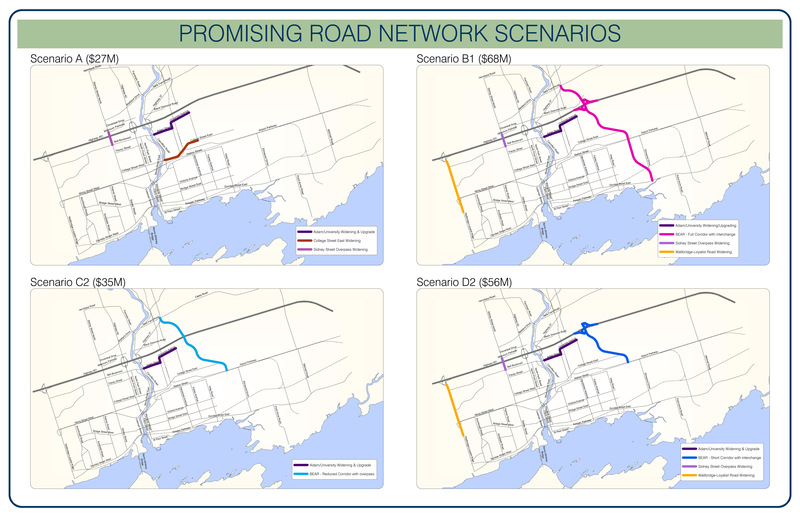 This Transportation Master Plan (TMP) will guide the provision of transportation infrastructure and services in Belleville over the next 20 years. It will ensure that adequate measures are put in place to support anticipated growth and meet future mobility needs, while achieving important safety, quality of life and sustainability objectives. The Plan will support economic development by improving accessibility and creating more travel choices, helping to promote Belleville as an attractive destination for visitors and businesses. 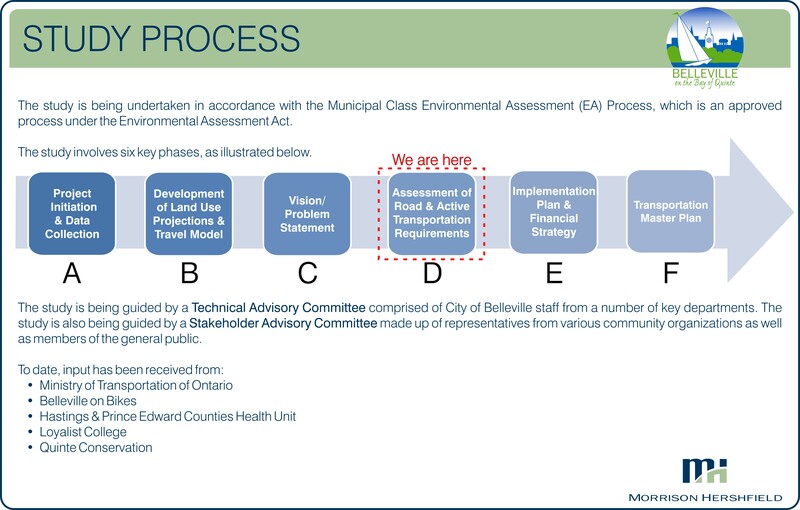 Towards this end, the Plan will be comprehensive, integrated, and multi-modal, addressing the needs of all Belleville residents both now and in the years to come. View the information from our Transportation Master Plan Open House from January 9. Click here to fill out the comment sheet from the Open House on January 9th and send it to the address provided at the bottom of the sheet. View the information from our Transportation Master Plan Open House from June 26.